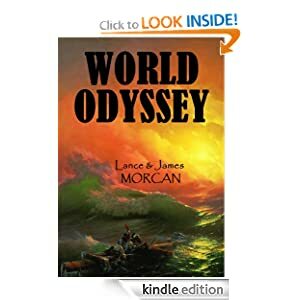 Newly released World Odyssey (The World Duology, #1) resonates with readers and book critics alike, so far attracting all 5-star reviews from Amazon reviewers. World Odyssey follows the fortunes of three young travelers as each embarks on an epic journey. Their dramatic adventures span sixteen years and see them engage with American Indians, Barbary Coast pirates, Aborigines, Maoris and Pacific Islanders as they travel around the world – from America to Africa, from England to the Canary Islands, to Australia, New Zealand and Samoa. They do look interesting. I’m intrigued. One question though — why did you release Book 2 (Fiji) first? Hi Sandra – Good question! Because Book 1 (World Odyssey) was an afterthought. It was only after readers of Fiji expressed interest in our characters’ back stories that we decided to write World Odyssey. As it comes first chronologically, we’ve called it Book 1. Are there any free (library) copies of these? I’d like to review them, but am a bit short on finances. Would love to collaborate with you and help you get some publicity! Thanks mate. Fiji: A Novel and The Ninth Orphan are our only books available as trade paperbacks (via Amazon or CreateSpace). Some libraries may stock them. Otherwise most will order them if requested. They and our other books are also available as kindle ebooks. We plan to bring all our books out as trade paperbacks in due course.